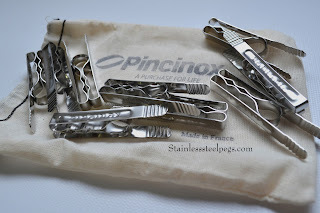 If you missed my review on my latest and greatest laundry product - the Pincinox Stainless Steel Peg - then you must catch my latest review here! To enter simply follow the Rafflecopter prompts below. Please also ensure that you pop your full name beside your comment so that your entry can be verified. Entries without this information will be sadly disqualified. Entrant must comment below this blog post as to why they need these pegs in their life! Good luck everyone! Don't forget that I also have an exclusive reader offer to receive 30% off your order at Stainless Steel Pegs. For the voucher code or further information, please check out the review post here. I like that these Pincinox Pegs would likely end up with my daughter, just as I have some of my mum's quality household items! This is new to me, as I always know the plastic or wooden pegs only. It looks stronger & durable compare to the other 2 counterparts & would definitely love to win & give it a try if I am one of the lucky 5 winners. Great that it doesn't leave that peg marks on the clothes either. It should be awesome with all these plus features. I live in a one bedroom apartment, with a shared laundry. Unfortunately we have nowhere to hang our clothes and use an air-dryer in the lounge room. These pegs would be great to keep everything in place, as that is lacking at the moment with the plastic pegs we currently use. We live in an area of very strong winds. Plastic pegs slide about & the wooden pegs snap apart in the wind. I need the Pincinox Stainless Steel pegs. Just fabulous thank you. I need Pincinox Stainless Steel Pegs in my house because after reading about these in your review i just fell in love with these. I have two boys and have lots of washing to do every other day - we live in victoria and every other day is windy here. I totally loved that these come with lifetime guarantee - will never rust ,break or fall apart like the palstic ones i normally use. The best part it that i can use these in the freezer. Our house definitely need these awesome stainless steel Pegs. Moreover these will be a perfect Christmas present for my friends who does a lot of washing as well like me. I need Pincinox stainless steel pegs because I'm sick of buying new pegs! It would be great to own pegs that will not rot from the rain, and I won't have to replace them throughout the year due to poor quality and weather. To be honest I have never heard about stainless steel pegs that can be used on clothes & in the freezer .With so many great qualities I am in desperate need of these in my life so that I never have to buy the plastic ones again which lasts hardly a year.